Cabin and northwoods style are all around me here in northern Minnesota. This Falls City Alumi-Lite minnow bucket is a great candidate for a stencil as it's not the more desired, older, galvanized type. 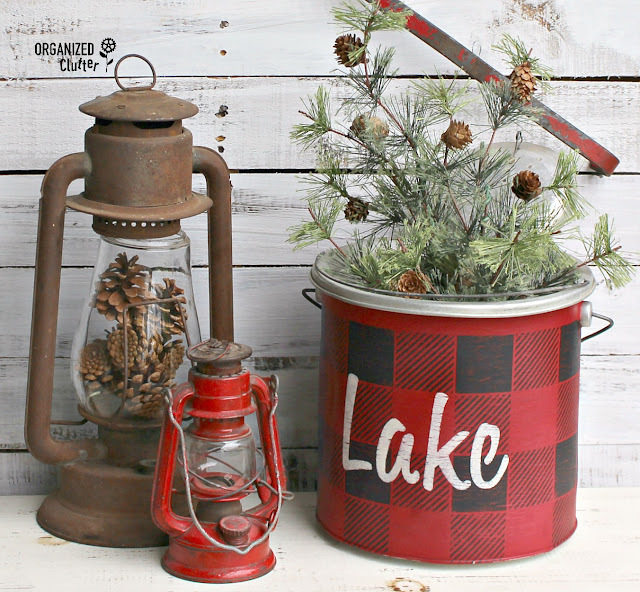 I had planned to use Rustoleum Colonial Red for my minnow bucket's base coats, but it was just too shiny and I opted for Deco Art Americana Chalky Finish Paint in Rouge . I brushed on two coats. Next, I positioned my medium Buffalo Check Stencil from *Old Sign Stencils onto my bucket with blue painters tape. I butted the stencil up to the lip. I used Ceramcoat Acrylic Paint in Black for the stencil. Be sure to hold the stencil down as flat as you can and keep your brush pretty dry to keep stencil from bleeding. The tricky part is by the handles. Funky Junk Interiors offers a great tutorial on how to stencil. "Lake" is stenciled in Ceramcoat Acrylic Paint in Light Ivory with the Lake Rentals stencil from the Old Sign Stencils Getaway Collection. After I sanded the bucket lightly with 220 grit sandpaper, I sealed it with two coats of Krylon Matte Satin Finish Spray . 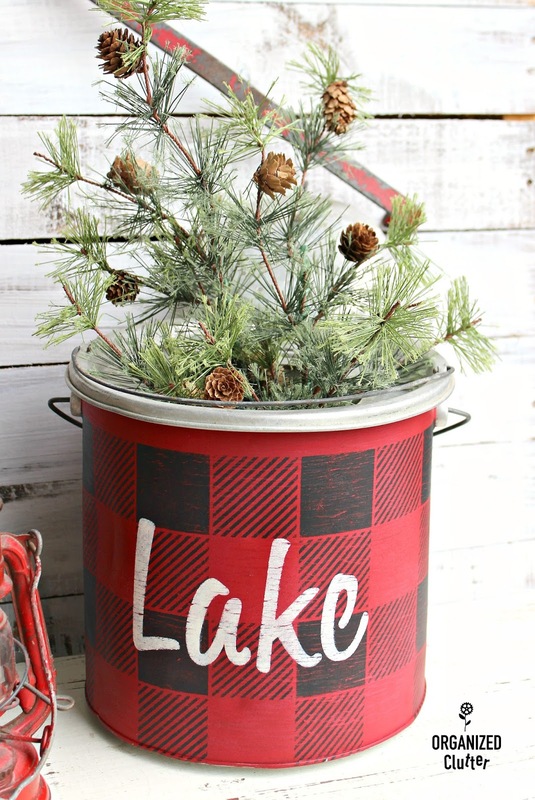 This stencil is perfect for Christmas! I interrupted my fall decorating to stencil this bucket! Still no pumpkins and gourds available here! Buffalo checks in the junk garden too! This is another minnow bucket. I love the whole vignette, Carlene! Wonderful! That check stencil is great, such a clever design. Your buckets look fab! 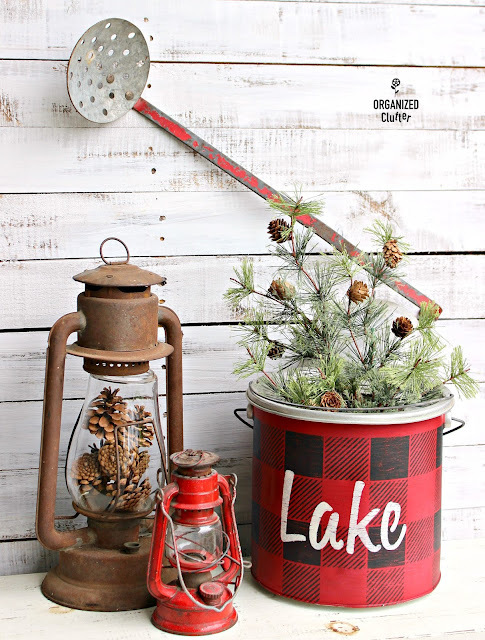 I just love how your bucket turned out! It all looks beautiful! Dear Carlene, you have me positively salivating to get Christmas on the go, thanks to this little bucket! Such a perfect touch. Thanks for doing the Buffalo Check and Lake Resort stencils proud! 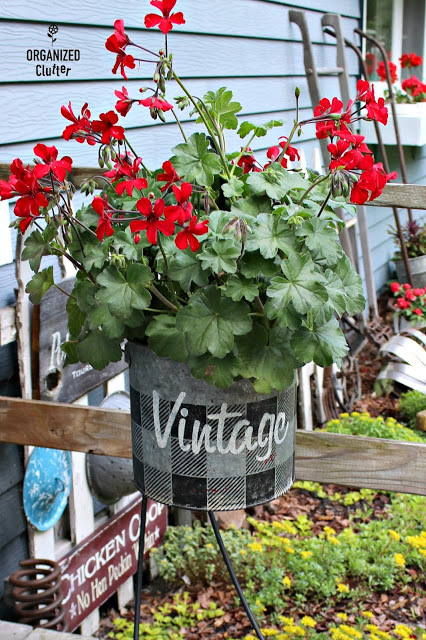 I've featured this in this weekend's DIY Salvaged Junk link party. Thanks for linking up! 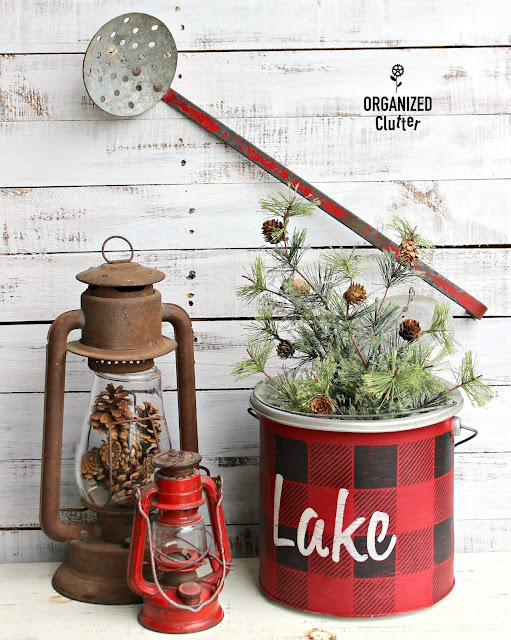 I adore this project and your vignette! We have a camp in the Adirondacks and this is a perfect project for up there! You may also have given me some inspiration for Christmas as well. LOVE it!